A classic, summer evening race. 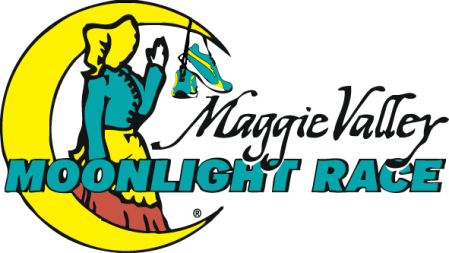 Glory Hound Events is proud to produce the 34th running of the Maggie Valley Moonlight Race on Saturday, August 22, 2015 at 8:30 pm. This race is the second oldest running event in Western North Carolina and we are proud to carry on this great tradition and welcome runners from across the Southeast. Hosted by the Town of Maggie Valley and the Maggie Valley Chamber of Commerce, the 8K road race will start and finish at the Festival Grounds in the heart of Maggie Valley. The Sunset Fun Run will start the festivities and precede the adult race at 7:30 pm. The safe, fun event is held inside the Maggie Valley Festival Grounds is designed mostly for small children. The rectangular course takes runners 1.2 miles up the valley on US 19 to Ghost Town, then 2.4 miles in the opposite direction, before returning them 1.2 miles to the finish line back at the fairgrounds. Runners will have the two westbound lanes all to themselves. The course is lit with street lights and those from emergency vehicles. Following the race, all runners are invited inside the Festival Grounds for post race food and drink, door prize drawings and the awards ceremony.